Contact Center Software Market size estimated at over USD 14 billion in 2017 and will grow at over 15% CAGR to 2024. 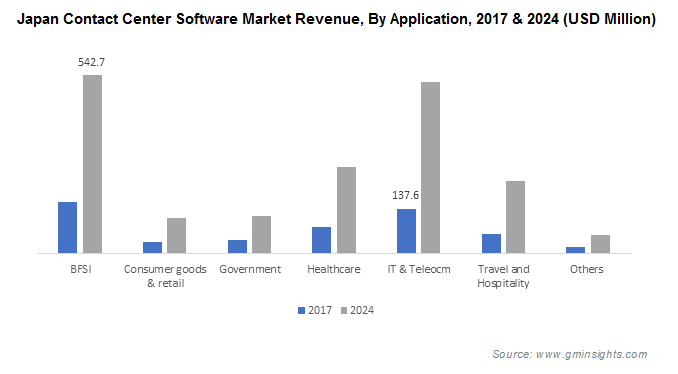 The contact center software market is projected to grow at a fast pace due to the rising demand for coordinating services across various channels including telephone, email, chat, web, fax, and social media. Providing such omnichannel experience ensures that each customer’s interaction reaches the associated resource at the required time providing a seamless and consistent customer experience. The rising investment made by companies in customer service initiatives & digital marketing platforms for handling customer relations efficiently has also contributed to the market demand. Also, the rapid adoption of advanced technologies including AI and IoT has a positive impact on the contact center market growth. These technologies enable enterprises to deliver advanced services with improved customer engagement by providing the customers with new information integrated into their existing infrastructure. They change the way businesses conduct their operations by reducing customers’ waiting time and delivering a proactive customer support. 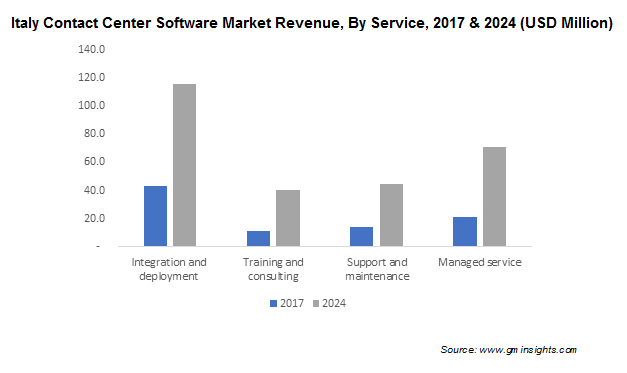 The software segment held the highest share in the contact center software market with a share of over 70% in 2017. Interactive Voice Response (IVR) dominates the software market as it assists in quick resolution of customer queries by providing them with pre-recorded responses for frequently asked questions or routing the customers to the responsible representative or department for complex queries. Various sectors including BFSI, hospitality, retail, and healthcare are deploying IVR software for enterprise websites for easy and continuous interaction with customers. Furthermore, the cloud-based IVR software is adopted by various organizations from customer call volume sales from marketing to support & service. These software programs provide a healthy analytical insight by tracking customer timeframe, call volume, and origin, assisting the employees in the scheduling process thereby cutting down on bad customer response and lost business. The integration and deployment service are anticipated to hold the largest share in the market over the forecast period. These services provide integration capabilities with legacy or custom CRM systems at workplaces, ensuring smooth and fast deployment of new solutions in the infrastructure. These services assist businesses in offering higher productivity, agility, and security, driving the market growth. The on-premise deployment model accounts for a large portion of the market as majority of the contact center operations depends on the traditional on-premise systems. The on-premise model gives the owner the leverage to decide how and when the software upgrades occur. It also provides the safety and security of confidential business data with the information being stored in-house. However, these contact center systems are established for location-specific deployments, which consist of the hardware and software architectures developed decades ago due to which the integration process across multiple sites is a complex and costly task. Hence, organizations are now shifting toward the cloud deployment model, providing easy customization with reduced operational costs. The BFSI segment dominated the contact center software market with a share of around 30% in 2017. The highly mobile friendly & web dominant environment has taken the consumer banking processes to a new level. In the U.S., the mobile payments rose from around USD 11.9 billion in 2012 to USD 90 billion by 2017. Customers are adopting mobile devices and social media platforms for managing their banking processes, augmenting the usage of the market. The adoption of cloud-based contact center software in the banking sector also enables companies to deliver better customer service. For instance, in July 2018, Aman Bank, a leading bank in Libya adopted the Oracle service cloud for enhancing its customer engagement and service capabilities. This enables the bank to automate its contact center processes on an omnichannel and centralized platform, effectively engaging with clients using their preferred communication platform. North America dominates the contact center software market and is projected to register a steady growth of over 13% during the forecast period. The cloud adoption rate of the North American contact center market increased from around 5% in 2012 to approximately 15% in 2016 with a positive impact on market demand. Companies operating in this region are shifting from product-based to customer-centric approach, creating a substantial demand for the market. Europe held the second largest share of over 21% in the global market in 2017. Due to the stringent government regulations, such as GDPR, the public sector and enterprises are implementing the contact center software solutions to carry out online tasks associated with citizens queries, feedbacks, and complaints. This ensures the security of the customer’s data along with the provision of improved services. The companies functioning in the global contact center software market are concentrating on new product development delivering enhanced services and gaining a higher customer satisfaction. For instance, in July 2018, Google launched the Google Cloud Contact Center AI to resolve uncomplicated calls with the help of AI and only transferring the critical customer queries to the human agents. This has assisted in reducing the hold time and delivering quicker services producing huge outcomes for the company. Some of the key vendors operating in the market are 8x8, Alcatel-Lucent, Ameyo, Avaya, BT, Cisco, Five9, Genesys, Mitel, Oracle, Nice, Top Down Systems, Fenero, SAP, Unify, Vocalcom, West Corporation, Zendesk, ZTE, and Aspect Software. 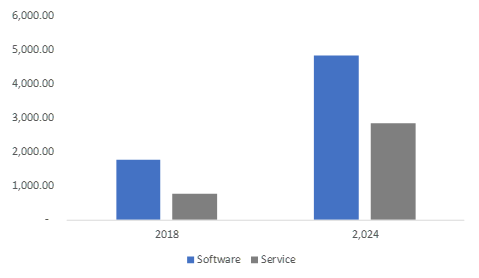 The rising requirements of delivering sophisticated services by businesses to their customers have resulted into corresponding growth in the market. Striving for enhanced efficiency in meeting the customer demands, the contact center and software providers are developing efficient and scalable solutions to deliver a unified communication platform, giving customers the leverage to communicate through different modes. Companies are also investing huge funds in R&D to implement new technologies and augment user experience, enhancing the market growth.